There are a lot of job opportunities out there for community management professionals. While the big job sites receive plenty of listings, the best way to cut through to the most attractive opportunities is to subscribe to resources that are dedicated to this industry. By all means, create job search email notifications on Indeed and LinkedIn for all relevant keywords and titles. Be sure to include keywords that will sort out online community manager jobs from offline ones (like managing an apartment complex). Jobs do slip through the cracks – I’ve seen it happen – and subscribing to the big sites helps you to not miss them. But the best bet for finding a great job is to clue in to a few key resources. Here are my favorites. Even if you have been in this space for a while, you might not have heard of all of them! I know that separating AngelList kind of goes against what I just said, as they are not a resource dedicated to our profession. But what I have found is that if you want to find a community job at a startup that you probably haven’t already heard of, they are really helpful. What I like about AngelList is that their search feature is really useful. “Community management” is a popular tag, and while some people do attach it to ridiculous jobs that have little to do with community, most companies seem to use it well. As I write, there are 155 startups looking for professionals with the “community management” tag. But if you look below the search box, you can find a number of different options. This is where you can really focus and find more senior roles. For example, if I wanted to find a community management job that pays at least $80,000 and offers equity, I can do that. I love that they have equity as such a prominent option. Their search is powerful in general. Use it to really focus on what you want and then, using an account on their site, save your filters and have them email you when new jobs appear that meet your criteria. The tech savvy audience, generally applicable (to us) use of the term “community” and powerful search feature is what makes AngelList stand out to me, versus more general job sites. There are a number of community management job boards out there. I even tried to get one started here way back when. But most of them require people to pay to post, and the people that pay are the only decent jobs you see. I understand why, and I have nothing against that. What it has meant, unfortunately, is that those job boards tend not to have many good jobs. CMX is a community management resource, conference and consulting firm, started by David Spinks. Carrie Melissa Jones, who I always enjoy speaking to, is the editorial director. They are doing a great job of curating their jobs section. They go out and find great jobs and use the job board to share the details. A weekly (at least) check of their board is sure to unearth new, cool jobs. SueOnTheWeb is Sue John, a veteran community management professional and someone I have a great deal of respect for. Similar to CMX, she maintains her job board by finding interesting jobs and sharing them. 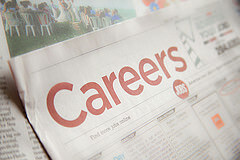 You can sign up for a weekly jobs email to receive a digest of new jobs. Also, I would recommend subscribing to this Twitter search, where you’ll be notified about these jobs and others. Sue regularly tweets (and retweets) job listings that are industry specific. Though their website definitely offers value, you’ll want to sign up for their weekly email roundup. It may just be a tiny link in their sidebar, but there is a ton of value here. It’s brief and to the point. First, it contains a list of community management and support themed articles and resources published recently. I like this because they don’t really (or only) link to themselves. They just link to value. But second, and most important for my purposes here, is that the roundup features a list of recent job postings. Some support, mostly community, some senior. It’s a great mix and it leans toward tech companies, since that is We Support’s focus. Between CMX, SueOnTheWeb and We Support, you’ll hear about the vast majority of cool or high profile (since high profile is not always cool, heh) community jobs. And then the keyword-based email notifications at the big job sites will help you pick up on the rare job that doesn’t cross their desks. If you are searching for a job, or just looking to advance your career, I hope you find the right position for you. Best of luck. Thanks so much for the shout-out Patrick! My pleasure, Sue. Thank you for your efforts! Thanks so much for sharing the CMX job board Patrick. One note to add, there’s also a link to a form at the top of the CMX job board that candidates can fill out so we can share their info with great companies who come to us looking to hire (we get a lot of that too). Sure thing, David. Thank you.